1717 East Ninth Building, also known as the East Ohio Building, is a skyscraper in Cleveland, Ohio. Completed in 1959, it was one of the first modernist high-rises in Cleveland, along with the Illuminating Building. It is currently the 22nd tallest building in Cleveland, at 275 feet (84 meters). It was designed by Emery Roth and Sons of New York City. 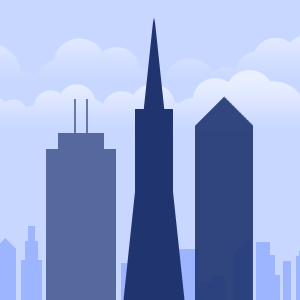 Tishman Properties also of New York City was the developer. Ground was broken in March 1958 and in April 1959 it opened to the public. The University Village is a complex of three apartment buildings located in Greenwich Village in the Lower Manhattan-part of New York City. The complex is owned by New York University and was built in the 1960s as part of the University's transition to a residential college. 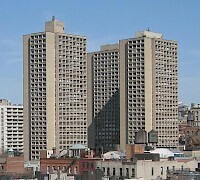 One of the towers, 505 LaGuardia Place, is a co-op that does not house students and the other two towers, Silver Tower I and Silver Tower II, house faculty and graduate students of NYU.